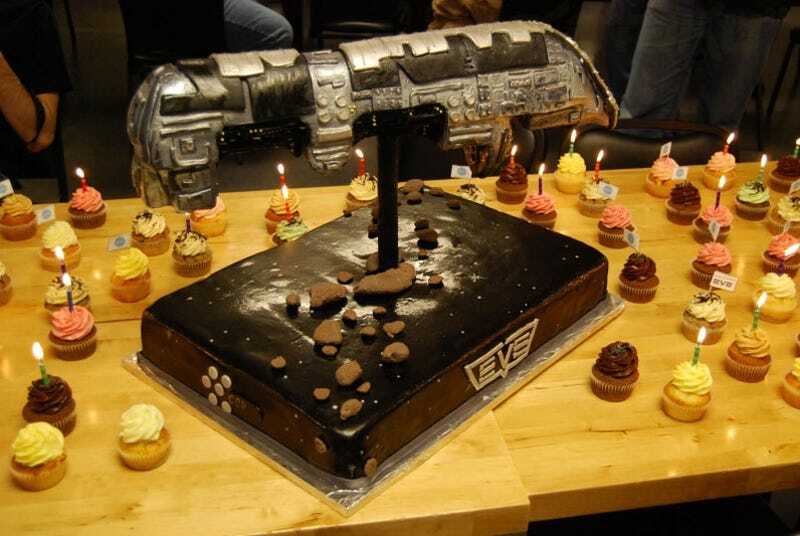 With EVE Online turning six years-old today and surpassing the 300,000 active subscriber mark over the past few days, there was really only one way for developer CCP to celebrate - spaceship cake. While other massively multiplayer online games have drawn huge numbers and then struggled to retain them, CCP's EVE Online has spent the past six years growing. So far 2009 has been very good to the game, with the concurrent user record being broken three separate times so far, with a standing record of 53,850 online at one time in one universe. The launch of the latest expansion, Apocrypha, has drawn even more players to the game, with active subscribers passing the 300K mark in the past week. Having started off the year with approximately 244,000, that's a 22% growth - for a six year-old game. Along with the announcement, CCP sent along this picture of the celebration cake they enjoyed at their North American headquarters in Atlanta. I'd congratulate them, but they know I live in Atlanta and neglected to invite me over for gamecake, a transgression I'm afraid I can never forgive. Check out their full announcement below, while I curl up on the couch with a Little Debbie Swiss cake roll and cry. EVE Online celebrates its 6th year of existence today—May 6th. That's six strong years of continuous growth thanks to tireless integration of user feedback into game design and pushing to release around two major free expansions per year. Our single-shard world, where everyone plays on the same shared server, has seen tremendous benefit from having each player able to interact and affect each other player in a persistent manner. From massive fleet battles to individual bonds of trust, every pilot in EVE has the potential to rock the ship of hundreds of thousands of others by their actions.